This is Jim Fiorendino, your host for On the Ocean. The ocean is a dynamic environment. Currents like the Gulf Stream, flowing northward along the east coast of the United States, transport huge quantities of water from the equator towards the pole. Microorganisms fix carbon from the atmosphere into a biologically available form. Massive tropical cyclones form each year during hurricane season, fueled by heat trapped in the oceans. What do all these processes have in common? They are all driven by energy from the sun. Through the process of nuclear fusion (above), our sun joins two hydrogen atoms to create one helium atom, releasing heat and energy. That energy, which we call light, travels 93 million miles to reach planet Earth. Light reaches Earth from the Sun at a variety of wavelengths, or energy levels. Some of these wavelengths are harmful; wavelengths we can see, known as the visible spectrum, range from about 400 nm to 750 nm. Most of the light that reaches Earth is within this range, but the full range of wavelengths extends from 200 nm to over 2000 nm. In the atmosphere, light is scattered, absorbed, or reflected by particles and gasses. Light at blue wavelengths tends to scatter most, which is why, on a clear day, you will see a blue sky. You may be familiar with the ozone layer, a section of the atmosphere in which a high concentration of ozone can be found. Ozone is a molecule of three oxygen atoms and is excellent at absorbing harmful ultraviolet radiation. By the time light reaches the ocean, only about half of the radiation that first reached the atmosphere remains. This is Jim Fiorendino, your host for On the Ocean. 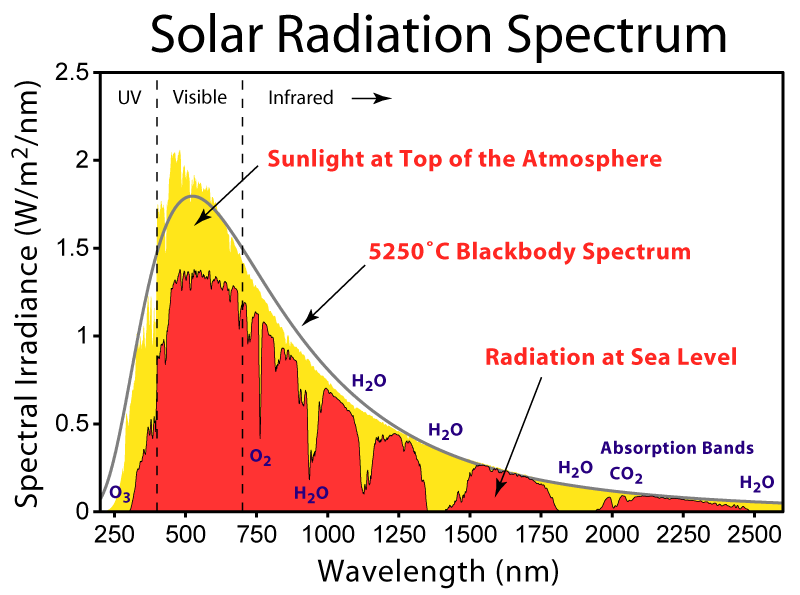 Only about half of the radiation reaching Earth from the Sun makes it through the atmosphere to the ocean; the rest is scattered or absorbed by particles and molecules in Earth’s atmosphere. What happens to the half that reaches the surface of the ocean? The amount of light that strikes the surface of the ocean is affected by day length, the weather (because clouds will block incoming light), and the angle of the sun in relation to the surface of the ocean. At small angles, more light reflects off the surface of the ocean. The angle of the sun and the length of a day changes with the seasons; this means the amount of light that makes it into the ocean varies greatly at the poles, which experience the most extreme seasonal shifts. Light is more consistent at the equator, where there is little seasonality. As light passes through the ocean, it is scattered and absorbed. 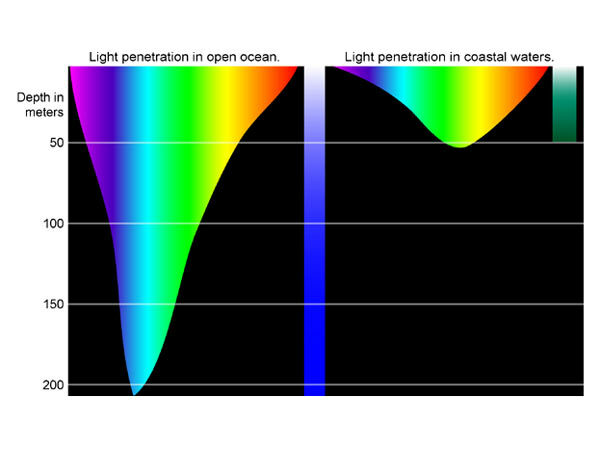 Light is absorbed differently, depending on its wavelength or energy level. Infrared radiation is absorbed as heat quickly in surface waters. Visible light is especially important, because this light is capable of driving photosynthesis, the process by which phytoplankton make food for themselves. The layer of ocean water where there is enough light within this spectrum to drive photosynthesis is called the euphotic zone. Different wavelengths of light within the visible spectrum produce different colors; colors of light behave differently in water. Red light is absorbed very quickly, within 30 feet in clear open ocean water. Blue light will reach the greatest depths. In perfectly clear open ocean waters, only 1 percent of light at the surface of the ocean remains at a depth of 500 feet. This is Jim Fiorendino, your host for On the Ocean. On average, the ocean is 12,000 feet deep; though light only reaches the first few hundred feet of water, it is an important factor in marine environments. Many marine organisms have developed specific adaptations over evolutionary time because of how light behaves in marine environments. Scales cover the skin of most species of bony fish. In addition to protection, some fish have shiny, iridescent scales that help to hide them in plain sight, particularly those that live in the open ocean like tuna or herring. Light in the ocean is often polarized, which means it travels with a specific orientation. Fish scales reflect light in the ocean, bending or changing its polarization, which makes the fish difficult to see. The coloration of marine animals, though striking in may cases, is about more than just looks; the pattern of colors on an organism’s body conveys some benefit for survival because of how light behaves in the ocean. For example, a shark’s skin is often dark on the upper, or dorsal, side and light on their bottom, or ventral, side. This type of coloration is called countershading and helps to camouflage the shark. Remember, light is absorbed rapidly in the ocean, so the deep ocean is dark while the surface is light. 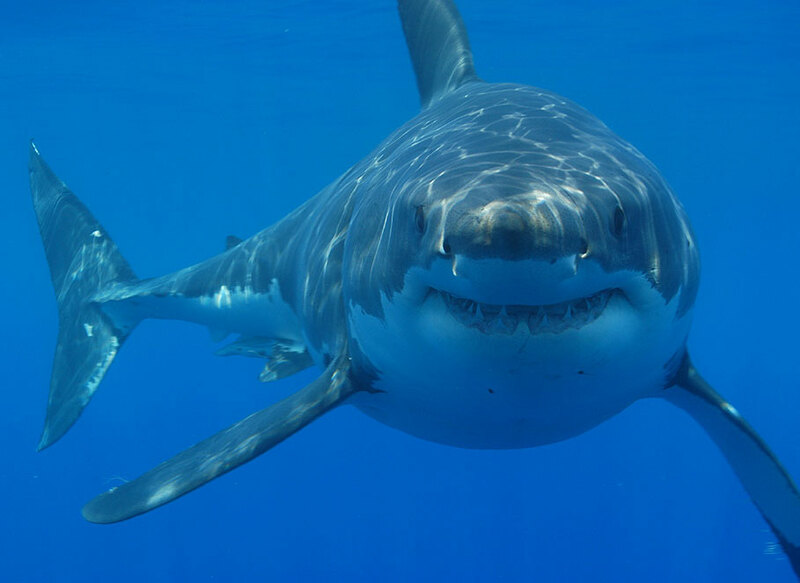 If a fish were to look at a shark swimming beneath it, the shark’s dark dorsal side would be hidden against the darkness of the ocean beneath it. If a fish were to look up at a shark swimming above it, the white ventral side would blend in with the illuminated surface waters. 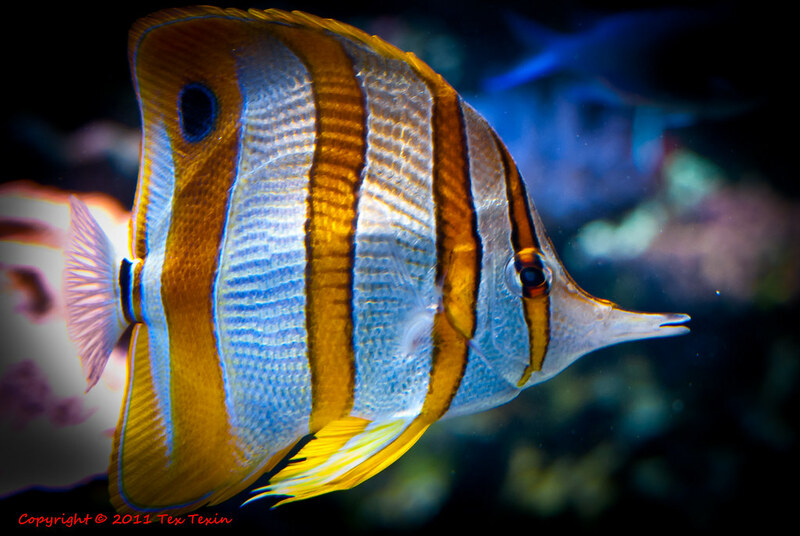 Additionally, patterns like stripes disrupt the outline of a fish, making them more difficult for a predator or prey to identify. This is Jim Fiorendino, your host for On the Ocean. Fireflies are a common sight on a summer’s night, blinking softly as they fly through the air. Fireflies are able to produce light through a chemical reaction in their bodies, a process known as bioluminescence. Bioluminescence is common in marine organisms, as well, producing some spectacular effects! Bioluminescence is the result of a chemical reaction between a pigment molecule, luciferin, and an enzyme, luciferase. Luciferase promotes the reaction of luciferin with oxygen, which releases light energy in the visible spectrum. The bioluminescence we see may come from the animal itself, or a symbiotic relationship in which an animal relies on bioluminescent bacteria to produce light. The deep-sea anglerfish has an appendage on its head called an esca which is home to bioluminescent bacteria. The anglerfish uses the esca and the light from the bacteria to attract prey. In addition to hunting, bioluminescence can be used as a defense mechanism or warning to predators, or even as a means of communication. Species of squid are known to use bioluminescence to hide themselves against the illuminated background of surface waters using light-emitting bacteria on their lower side, making them difficult to spot when seen from below. Some dinoflagellates, a major group of phytoplankton, are known to produce light in response to predation. When disturbed, these phytoplankton light up, drawing attention to the location of the zooplankton, which may then be targeted by a higher predator following the light produced by the phytoplankton.